Home » Augmented Reality » How VR and AR can redefine the future of Media and News industry? The 2017 Global Entertainment and Media outlook forecast unveiled a ground-breaking fact that in entertainment and media space, virtual reality (VR) continues to be the fastest-growing segments. The projection further states that within 3 years from now 68 million VR headsets will be used in the U.S. which will increase the VR content revenue to $5.0 billion. These predictions show the growing interest of the industry in the adoption of immersive VR experiences in delivering content which is engaging to the audience. Though this might sound very promising, yet the stature of journalism is questionable as of now. With the widespread use of social media, a wave of fake news spreads like wildfire and this puts a question mark on the credibility of the whole news industry. People are double checking every link posted on social media, every video they watch, and every news they read. The manipulation in still and moving images has ruined it for the news industry. People don’t trust when an image is presented as an evidence for something. As we are evolving and becoming complex beings so are our problems. Virtual reality is now used by the news industry to regain their credibility. The reason why VR is essentially recommended is that it puts a supplementary sense of participation in the minds of viewers. To fix the broken trust, putting viewers at the center of events which make them feel like they are directly participating in the event, is a wise way out. But is it as easy as it sounds? The introduction of VR has brought challenges to the job of journalists. In the ongoing communication flow between the news organizations and the general public, the job of a journalist is to remain unbiased and present the opinions of all the parties involved. Now with the introduction of VR in the news industry, the role of the journalist is even more challenging. For example, while shooting with a VR camera, cropping a scene or zooming in will create bias. How far can you stretch the definition of transparency for a journalist in the VR world is the main question here. You might crop something because it was irrelevant but it might be an essential element for the viewer. There would be some ethical challenges as well. For example, in a world which is increasingly violent, how appropriate is it to make the viewers virtually experience a scene of gore, death and other disturbing news events? The good news for the news industry is life-like and immersive experiences are not just limited to the VR. In the media and entertainment world, AR can also be used for content delivery. AR is a charm for those who prefer to explore the world and experience action with AR technology to intensify their real-life experiences. While to those who choose to stay at home and enter another world with their VR headset, VR is still the best. Let’s recollect AR with your Snapchat filters or the Pokemon Go game, where selfies had overlays of animated filters, now AR can be used to augment the various other aspects of our environment and experience as well. 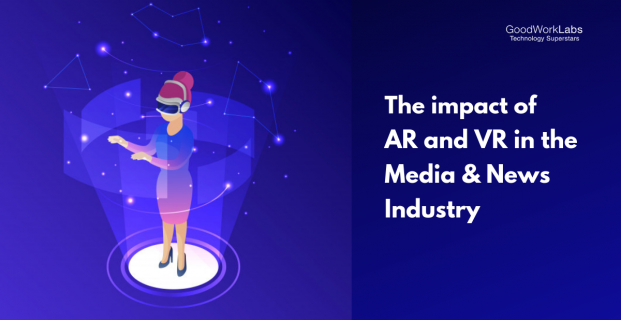 This a promising start for the news industry as AR is already well accepted by the audience in the form of motion pictures, television, and apps. The concept is already well-accepted by the audience. The most important aspect is that the capabilities of AR to augment the relevant aspects of the environment while subsiding the irrelevant ones can create engaging and convincing content. Are AR and VR diminishing social interactions? It is a common perception that AR/VR are isolating individuals from the real world rather than connecting them to it. The main purpose of the news industry is to keep an individual connected to the events that are happening around him. This perception can be a natural hindrance to the news industry but this perception is not accurate. There is a VR movie theatre operating in the world right now which lets people with any VR headset sign in and sit with a virtual audience in a virtual movie theatre. It also allows them to chat with other individuals before the movie begins. This example clearly explains why VR is not isolating but connecting individuals from distant locations and letting them share experiences. What is in the future of the news industry? The media and news industry never lag behind in the adoption of an innovative technology in order to reach out to their audiences. With AR and VR, the audience can be drawn deeper into the news content. Also, they will be able to experience the news story as a first-person. This is a big transformation for the conventional news mediums and should be taken seriously. This brings us to the conclusion that the potential of virtual reality is very powerful and if used to connect people to stories it will raise the level of empathy for events occurring in distant corners of the world. It has the power to pull the strings and make people put efforts beyond their comfort levels. In the current world scenario, all we need is mutual support and empathy. This will solve 50% problems in the world we live in. The media and the entertainment industry now need to rethink the potential of weaving their current system around AR and VR.